Tribalism and clannishness are coeval with human social life. Yet the recent worldwide outbreak of fundamentalisms, nativisms, nationalisms, and separatisms suggests that something portentously new is afoot, a kind of global backlash against the perceived failures of liberal societies. One familiar example, in both America and Europe, is panic in the face of a real or threatened influx of culturally diverse immigrants. That the president of the United States finds political advantage in stoking such anxieties is another sign of our identity-troubled times. 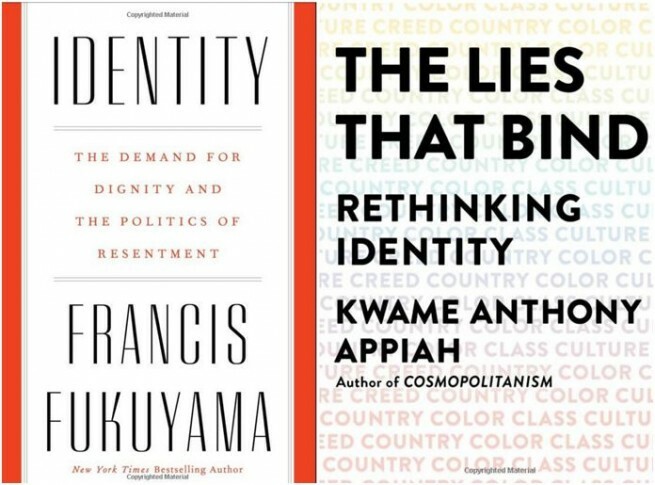 Francis Fukuyama in Identity and Anthony Appiah in The Lies That Bind share an admirable ambition: to change the way we see membership and belonging in the hope that this will help defang religious bigotry, ethnic prejudice, and other ill-disposed forms of group self-understanding and thus allow individuals with dissimilar traits and backgrounds to coexist peaceably and enrich each other’s lives. As this debatable thesis suggests, Fukuyama sides with those who fault the Democratic Party for attempting to build “a coalition of disparate identity groups.” “Activists on the left” turned their backs on the antipoverty programs and redistributive policies that would have helped struggling whites in order to pursue positive discrimination for marginalized groups—blacks, women, immigrants, and LGBT people. They stopped paying attention to “the white American working class” just as it was being “dragged into an underclass.” Without questioning how important “Donald Trump’s working-class supporters” were to his Electoral College victory, Fukuyama wants us to know that they were not wrong to “feel they have been disregarded by the national elites.” On this interpretation, the left’s coddling of minorities compelled many economically distressed voters to rally around their own white Christian identity in self-defense. Fukuyama is not wholly opposed to identity politics. The two examples he cites as welcome correctives of injustice are the #MeToo movement and Black Lives Matter. But his main point is that positive discrimination in favor of minorities has fomented a dangerous backlash among a population already traumatized by deindustrialization and and an inverted world where “women were displacing men in an increasingly service-dominated new economy.” And he adds a second charge: the multiculturalist apotheosis of separate, distinct, and internally homogeneous social groupings is incompatible with the national integration of a diverse population through shared primary and secondary education. Fukuyama is especially shocked by those who view the integrationist demand for monolingual public schooling as somehow racist and intolerant when it is actually eminently democratic. He recognizes, of course, that the fragmentation of the American public into “self-contained communities, walled off not by physical barriers but by belief in shared identity” has been “facilitated by technological change.” What disturbs him, however, is less the mutually inaccessible niches of reciprocally applauding partisans made possible by the Internet than the politically motivated shift of attention, allegedly pioneered by the left, “toward the protection of ever narrower group identities.” The “ever-proliferating identity groups inaccessible to outsiders” celebrated by multiculturalists not only threaten to destroy democracy, they augur the end of rationality. Mutually suspicious and insulated groupings are incapable of rational debate. They no longer share a common world or a common understanding of the difference between truths and lies. But if identity politics on the left provoked the emergence of identity politics on the right, what caused the rise of identity politics on the left? Fukuyama answers this question with his signature invocation of economic and cultural factors. On the one hand, deunionization of workers and tax evasion by the wealthy have made the resort to fiscally undemanding symbolic politics almost inevitable. For the left, in particular, budgetary austerity made it “easier to talk about respect and dignity than to come up with potentially costly plans that would concretely reduce inequality.” But constraints on spending alone cannot explain the rise of multiculturalism and minority rights. undermine the legitimacy of the American national story by emphasizing victimization, insinuating in some cases that racism, gender discrimination, and other forms of systematic exclusion are somehow intrinsic to the country’s DNA. Alongside this grand narrative with only patchy empirical support, Fukuyama fields a handful of policy proposals. His premise is that liberal democracy will not survive “if citizens do not believe they are part of the same polity.” The “remedy” he advocates is “to define larger and more integrative national identities that take account of the de facto diversity of existing liberal democratic societies.” Because political coherence cannot be restored to America on the basis of common ancestry or a shared cultural heritage, no matter how judiciously the country manages immigration and assimilation, he urges Americans to adopt “an inclusive sense of national identity” anchored in constitutional democracy and the rule of law. On this basis, Fukuyama trumpets an agenda aimed at “the successful assimilation of foreigners” into what he sees as America’s “dominant culture.” The United States should continue to be open to immigrants from across the world. But it should do so only in modest enough numbers to facilitate the gradual process of assimilation and to avoid the kind of cultural shock that is bound to excite demographic panic. We must make sure that newcomers become “irrationally attached” to America’s “creedal identity,” which boils down to a “belief in equality and democratic values.” These abstract principles should be woven into uplifting “narratives” that are taught to the children of immigrants in public schools. Their emotions of “pride and patriotism,” and not only their intellects, must be engaged. Fukuyama’s analysis is flawed in several ways. Three decades ago, he argued that the human desire for respect and recognition was the driving force behind the universal embrace of liberal democracy. Today, he depicts the human desire for respect and recognition as the driving force behind the repudiation of liberal democracy. The reader’s hope for some account, or even mention, of this extraordinary volte face goes unfulfilled. Nor does Fukuyama squarely address the impossibility of explaining recent ups and downs in the prestige of liberal democracy by invoking an eternal longing of the human soul. What’s more, he fails to consider the possibility that after 1989 the obligation for ex-Communist countries to imitate the West, which was how his End-of-History thesis was put into practice, might itself have been experienced in countries like Hungary and Poland as a source of humiliation and subordination destined to excite antiliberal resentment and an aggressive reassertion of nationalism. Similarly, to blame the rise of white nationalism in America chiefly on the left’s profligate attentiveness to marginalized groups is to deemphasize the multiplicity of factors involved, including a history of anti-immigrant nativism that long predates the emergence of multiculturalism. One wonders, for example, if resentment of Barack Obama, whose presidency upended a racial hierarchy that has been fundamental to US nationhood since its inception, might not provide a simpler and more realistic explanation for the country’s relapse into nativism than outrage at multiculturalism and inequality. Another problem concerns Fukuyama’s overly romantic understanding of “lived experience.” It seems fair to say that white American motorists have difficulty comprehending the experience of black motorists stopped by lethally armed police officers. What is completely implausible is to suggest, as Fukuyama’s analysis does, that late-eighteenth-century ideas about incommunicable interiority and plenitudes of inner feeling help explain that difficulty. Finally, Fukuyama’s occasional suggestion that white nationalism reflects a rational concern that new immigrants will not successfully assimilate can also be questioned. Could not extreme nationalists be more afraid that newcomers will successfully assimilate? After all, the implication of successful assimilation is that the identity of natives is something wholly superficial and not really an indelible inheritance that connects them profoundly to their dead forefathers. If so, intensified efforts at assimilation, rather than dousing the flames of white nationalism, might unintentionally add fuel to the fire. The core of The Lies That Bind is a sequential study of five subjects: religion, nation, race, culture, and what Appiah calls “class” but would be better described as inherited social status. In each case, he exposes the mistakes, fallacies, and misunderstandings inherent in the way these classifications are generally understood and applied. All of them are “false” in some important sense and distort the way we see ourselves and treat one another. Although “every identity has its own distinctive misconceptions,” each of the ones Appiah studies (class aside) suffers from a fault he calls “essentialism about identities,” which is to assume that there exists an “inner something” common to all members of an identity group. This is untrue: “In general, there isn’t some inner essence that explains why people of a certain social identity are the way they are.” The facile supposition that “similarity” or “sameness” can create group cohesion or explain why groups “hold together” is absurd on its face, since similarity and sameness are not social relations at all but simply comparisons that imply nothing about cooperative inclinations or emotional identifications. As a philosophical nominalist, Appiah wants us to reconceive religious, national, racial, and cultural identities as “labels.” They are not accurate representations of or references to existing realities but rather coordinating devices or “ways of grouping people” that, for good or ill, allow us to simplify a complex reality by attributing a spurious homogeneity and unchanging nature to heterogeneous and constantly shape-shifting swaths of the human population. For example, you may think of yourself as sharing an ethnic or religious identity with predecessors who lived centuries ago, but this is a delusion. All you have in common is the “label.” Indeed, you probably share more habits of the heart, not to mention DNA, with a next-door neighbor who adheres to a different religious tradition than with distant ancestors who bore your beloved label. Similarly, those who extol “the West” or “Western civilization” mistakenly believe that a culture is an organic whole that tightly knits together all its parts. Racists among them assume that biological ancestry presents almost insuperable barriers to the cultural Westernization of non-Westerners. In truth, “Western civilization” is a vacuous concept since a culture, by definition, “is messy and muddled, not pristine and pure.” It follows that we “should give up the very idea of Western civilization,” not only because it is associated with racialist prejudice, but also because it refers to nothing except “a loose assemblage of disparate fragments” perpetually undergoing kaleidoscopic reconfigurings. Because it makes no mention of the fatal flaw of essentialism around which his other “test cases” are organized, Appiah’s fascinating chapter on “Class” needs to be mentioned separately. He begins with the sociologist and social activist Michael Young’s idea that meritocracy, if it were ever established, would be an especially humiliating form of social hierarchy because those at the top would try to justify their privileges on the grounds that “equality of opportunity” is eminently fair and therefore those who succeed deserve to enjoy the fruits of their talents and efforts. Young’s attack on this spurious justification focuses on “the desire of families to pass on advantages to their children.” The capacity of parents to prepare their offspring for life’s challenges varies greatly across class lines. As a result, what passes for equality of opportunity will inevitably produce the oxymoron of an inherited meritocracy. In a modest effort to align Young’s analysis with the central thesis of his book, Appiah emphasizes a second way in which the myth of meritocracy leads us to assign credit where no credit is due. No one deserves their natural talents or capacity to make an effort any more than they deserve their parents. Rewarding effort and talent, therefore, amounts to a morally arbitrary and unjustifiable allocation of benefits to those who won a genetic lottery. As a philosophically rigorous analysis of what individuals genuinely “deserve,” this argument is unexceptionable. If generally accepted, however, it would make nonsense of most of the culturally (and legally) familiar ways in which we assign praise and blame. This suggests a potential weakness in Appiah’s project of unmasking socially consequential lies. Even though his deeper truths may make good sense in theory, they are unlikely to have much effect in practice. Appiah’s approach has a few other problems as well. He may have a good reason for associating “essentialism” with characteristically nineteenth-century mistakes about identity while simultaneously declaring that the human species has always, from time immemorial, been “prone to essentialism.” But he leaves his readers unsure if he is fighting a period-specific fallacy or human nature itself. Second, his decision to treat his five identities sequentially means that he devotes insufficient attention to the crucial phenomenon of cross-cutting identities. In most of the book he comes out in favor of fluid, ambiguous, and constantly “renegotiated” identities, which he associates with tolerance for diversity and an openness to all humanity. But a shared religion, for example, can lead fellow believers to ignore differences of nationality, just as a joint combat mission in wartime can lead fellow soldiers to ignore differences of race that would otherwise be unbridgeable. In his detailed exposition, Appiah illustrates this point a number of times, explaining, for example, that every identity “comes with mechanisms by which fellow members recognize one another.” The self-conscious in-groups that result are inclusive because they are exclusive, as when Americans devoted solely to gay rights make common cause with LGBT advocates in culturally remote countries. Particular identities, as a result, “can expand our horizons to communities larger than the ones we personally inhabit,” connecting “the small scale where we live our lives alongside our kith and kin with larger movements, causes, and concerns.” Such passages contain an implicit admission that particular and inflexibly entrenched identities not only “divide us and set us against one another” but can also connect us with geographically distant members of our narrowly defined identity group. That Appiah understands perfectly well the antiparochial potential inherent in particularistic identities is implied by his mild boast that “intellectuals like me” have readers among “educated people in every continent.” But he fails to integrate this insight persuasively into his general theory. His project of liberalizing and loosening all arrogant, entrenched, dogmatic, aggressive, and barricaded identities by showing how they are based on nothing substantial runs into another problem as well. Without grouping ourselves and others in ways that overlook intragroup variety and change, he admits, human beings could never solve their collective action problems or mobilize loyalty to pursue important shared objectives. So what would happen if Appiah succeeded in replacing the lies that bind with pictures that are “closer to the truth”? Consider an identity steeled in underground resistance and evading manhunts, such as that of decolonization partisans in, say, 1950s West Africa. If this identity had been less unrelenting and aggressive, if it had not imbued group members with a partisan definition of their shared task and purpose, would it have been equally successful? What this passage and indeed this entire book make clear is that Appiah himself possesses a distinctive personal identity involving rather stable (not constantly renegotiated) moral commitments of an admirable and arguably noble kind. His cosmopolitan identity is no less a “label” and no more firmly grounded on the realities of the human condition than the parochial identities that he, like Cavafy and Svevo, would find personally insufferable. But the reader need not accept any suggestion to the contrary to appreciate the breadth of knowledge and wealth of insight contained in this exquisitely conducted tour of identity’s many troubled and promising contemporary horizons.